My mom did some kind of magic to her beef ribs. I didn't get her exact recipe (she rarely gives away all her secrets, even to me!) but I did throw in some of my tricks for tender ribs. The slabs of ribs are coated with a homemade rub using spices you most likely already have in your pantry. Once coated, the ribs are wrapped in foil and left to chill overnight, allowing the meat to both tenderize and absorb some flavor from the spices. The next day, place the foil wrapped ribs on a baking sheet and let them cook low and slow in the oven or crockpot. The ribs are removed from their foil wrapping, basted with a honey BBQ sauce and then baked once again for a slight crust. 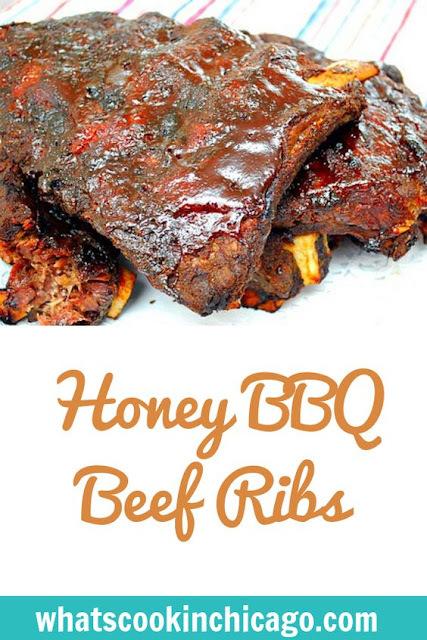 These ribs may not be traditional in the sense of being cooked low and slow on an open flame, but they sure are finger lickin' good and ridiculously tender without much effort! Combine all the rub ingredients in a small bowl. Coat the beef ribs with the rub and wrap each slab of ribs in foil. Place rubbed and wrapped slabs of ribs in the fridge to chill at least 6-8 hours or overnight. Meanwhile while ribs are baking, combine the BBQ sauce ingredients. Remove the foil wrapped ribs from the oven and carefully transfer the ribs out of the foil and onto another baking sheet. Increase the oven temperature to 375. 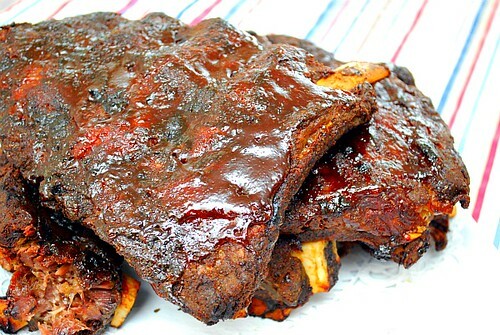 Baste the cooked ribs with the prepared BBQ sauce and place back in the oven to form a slight crust. Bake for 10 -15 minutes. Remove from oven and allow to cool slightly before cutting and serving. Sounds delicious,I think I'll try them this weekend! !